The Accu-Chek Mobile test cassette features 50 tests in one cassette, so there is no handling or disposing of strips. Improved handling. The guidance tabs can help you to avoid unintentional contact of the skin with the test area. This means easy blood application and improved handling. 50 tests in one cassette. The Accu-Chek Mobile test cassette allows you to carry 50 tests on one continuous tape rather than a pot of individual test strips. No more test strips. As the Accu-Chek Mobile test cassette incorporates a continuous tape, it removes the inconvenience of having to handle individual test strips. The Accu-Chek Mobile test cassette may be available on prescription, please contact your healthcare professional. Alternatively, it can be purchased at selected Boots stores or on their website. How to perform a test with the new cassette. You may have learned that you should hold your meter vertically during blood application. Now, with the new guidance tabs, just hold the meter in a way that lets you see the test area when applying blood. Place your finger gently on the guidance tabs so that the drop of blood comes into contact with the centre of the test area. That’s it! The guidance tabs can only be used for taking a blood sample from the fingertips. They are not designed for taking a blood sample from other sites (AST). 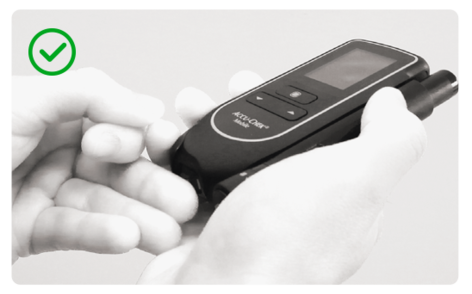 First steps: This short video to see just how fast and easy it is to set up and use the Accu-Chek Mobile blood glucose monitoring system for the first time, including inserting a new strip free test cassette. Performing a blood glucose test: This video will show you how to perform a blood glucose test correctly using the Accu-Chek Mobile system so that you get the most accurate results. Please also download the proper testing instructions leaflet. Using your lancing device: This video will show you how to use the integrated Accu-Chek FastClix lancing device that comes with the Accu-Chek Mobile system to obtain a blood sample for testing your blood glucose level. SAFETY ADVICE: The Accu-Chek Mobile meter and Accu-Chek FastClix finger pricker are intended for patient self-monitoring by an individual person only. They must not be used to collect blood from more than one person as they do not incorporate any features to guard against cross-infection. Please login to download the reference materials below. Why did the test cassette change? The new test cassette is the result of our constant effort to improve our products. We want to offer you the best possible test experience together with the highest standards of quality. What is the difference between the former and the new cassette? The main difference is the guidance tabs which prevent unintentional contact of the skin with the test area. How do I recognise a new cassette? You can recognise that you have a new test cassette by the green label on the test cassette package which says “Improved test cassette”. The main visible change of the test cassette is the two guidance tabs next to the test area. Do I have to change how I measure? Please note that alternative site testing (e.g. arm) is no longer possible – fingertips only. Is alternative site testing still possible with the new cassette? No. The new test cassette is designed to obtain a drop of blood from your fingertips. It is no longer possible to use alternative site testing such as forearm or upper arm. Can I still use the former cassette? Yes, you can still use the former cassette until it expires. Can a test cassette with tests remaining be reused if it has been removed from the meter? If the test cassette you removed still has unused tests and is still within the "use by" date, you can reinsert the cassette into the meter. The meter recognises the cassette, the number of available tests and the expiry date. Can control solutions from other systems be used to perform a control test? No, a control solution, other than the Accu-Chek Mobile control solution cannot be used as it will not reflect to the target control range or target control value. Additionally the Accu-Chek Mobile control solution applicator is specially designed to apply the control liquid to the test area of the cassette. It allows only a small amount of sample to be applied. This avoids the solution entering the system and soiling it. Yes, you can change the AAA batteries whilst a cassette is inserted. Does the Accu-Chek Mobile system lose the memory or the time and date settings when changing the battery? The stored values and settings remain saved in the meter while the batteries are changed or if the meter is stored without batteries. The meter has an in built back-up battery. This provides the power when there are no batteries inserted. The back-up battery lasts about 2 years and cannot be replaced if it is empty. An empty back-up battery has no effect on the functioning of the meter. If the back-up battery is empty the user has 10 minutes to change the batteries. If more than ten minutes elapses the meter forgets the time and date. When this happens, dashes appear on the display instead of the time and date. In this situation the time and date will have to be set again manually. Can the Accu-Chek Mobile system be used for neonates? No, the system cannot be used for neonates. Can the Accu-Chek Mobile system be used in the professional sector (hospital or doctors office)? No, The Accu-Chek Mobile meter and Accu-Chek FastClix finger pricker are intended for patient self-monitoring by an individual person only. They must not be used to collect blood from more than one person as they do not have any features to guard them against cross-infection. Can the brightness of the OLED display be adjusted? Yes, by entering the brightness menu. 3 levels are selectable. The longer the bar on the display, the brighter the display. Can the volume of the beep tones be adjusted? Yes, by entering the volume menu. 5 levels are selectable. Does the Accu-Chek Mobile meter indicate when the test cassette has expired? If a standard test cassette is inserted in to the meter, the meter checks regularly when the cassette was inserted and calculates the use-by period from this. Each test cassette must be used up within 90 days (use-by period). If a standard test cassette is inserted into the meter, the use-by period is calculated from the date when the cassette was first placed in the meter. This date is stored in the cassette. The meter also checks whether the expiry date of the cassette has been reached. The expiry date is shown on the test cassette box. If either of the two dates – use-by period or expiry date – is exceeded, the cassette has expired and further tests cannot be performed with this test cassette. If a test is started and the cassette is going to expire shortly or has already expired, the meter will inform you of this. A notification relating to the expiry of the test cassette appears 10 days before it expires, subsequent notifications appear 5, 2 and 1 day(s) before expiry. 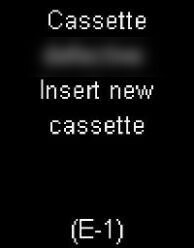 If the test cassette has expired, a message will ask the user to replace it. Does the Accu-Chek Mobile system need to be cleaned? The Accu-Chek Mobile does not require cleaning if the system is handled as instructed. However if it is misused (e.g. the meter is held upside down when applying the blood or control solution, and/or the blood or control solution sample is bigger than 5 µL) the optic parts can become dirty. It is possible to clean the optic parts (refer to the instruction manual). Does the OLED display need more power than LCD Displays? Yes it does. The higher the level of brightness selected, more power is consumed. Default setting is Level 2. High energy batteries last approximately 500 tests or 1 year. The number of tests may be reduced when the measurement frequency is extremely low (one test per week) or the meter is left unused. Setting the display brightness to level 3 and the beep volume to level 4 or 5 or using the acoustic mode permanently also impacts battery life time negatively. The number of tests may be improved when the test frequency is high. The new Accu-Chek Mobile meter stores up to 2,000 test results with date and time automatically. How often can control solution be ordered? Control solution for the Accu-Chek Mobile system can be ordered every three months. Should you need more, please contact the Accu-Chek Customer Careline. How robust is the motor and the mechanism? The motor as well as the mechanism has been designed to last for at least 10,000 tests. Additionally, the stability has been tested with a number of drop and vibration tests. How can the beep tones and acoustic mode be switched on? Acoustic reminders and beep tones can be switched on or off in the 'Tones' menu. Please be aware that to use the acoustic mode, both acoustic mode and beep tones must be switched on. Is it possible to confirm that a control test result is ok? In the process of using the control solution to perform a system check the meter will display the result, the target range and whether the control test is ok or not. In order for this to happen, the displayed result will need to be flagged as a control test. Additionally, the target range and/or the target value can be found on the top of the test cassette packaging. Is it possible to insert the test cassette incorrectly? No, it is not possible to insert the cassette the wrong way. Is the OLED display readable in bright sunlight? OLED technology screens can be hard to read in bright sunlight but shading the display with your hand will make the display legible. Is the test result affected by altitude? The Gluc-DOR enzyme used has a negligible dependence on the atmospheric oxygen level. For this reason its altitude dependence is also extremely small. We guarantee full functionality up to 4,000m (13,123 feet). What happens when a new test cassette is inserted in to the Accu-Chek Mobile system? When a new test cassette is inserted, the Radio Frequency Identification (RFID) tag informs the meter about the specific properties of the chemistry in this test cassette and all coding information is given. The meter turns on, the display check appears and the user is shown the information about the cassette's expiry date. The number of available tests is indicated then the main menu is displayed. The meter is now ready for testing. What is a Radio Frequency Identification (RFID) tag? A Radio Frequency Identification (RFID) tag is a label containing a memory chip and an antenna using radio waves for the communication between the reader (the Accu-Chek Mobile) and the tag (the label on the cassette). The RFID tag is placed within an adhesive label. How reliable is the coding process via Radio Frequency Identification (RFID)? All lot-specific coding information is stored in the Radio Frequency Identification (RFID) tag with an overwrite-protection. There is no way to change the stored information in the RFID tag. What is the process for replacing a test cassette? The test area works with blood or control solution quantities in a range from 0.3 µl to 5.0 µl. The special sink area deals with excessive sample dosing storing up to 5.0 µl. 4 different flags can be used to describe certain events connected to the result or particular characteristics of the result. A flag can only be set if the 'Set Flag' menu is opened while the test result is still displayed. Why are the batteries inserted when the Accu-Chek Mobile system is delivered? The Accu-Chek Mobile system is delivered with the time and date set at the factory. Power is supplied by a 3rd internal battery. During storage a protective foil prevents the 2 AAA batteries losing any power and the settings are preserved using the internal battery power. To activate the AAA batteries, pull out the protective battery foil and they will take over from the internal battery. What does the error code (E-1) mean? 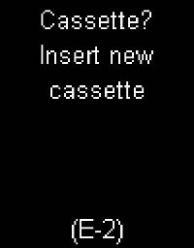 Cassette expired: insert new cassette - The use by period or use by date of the test cassette is exceeded. Insert a new test cassette in the meter. 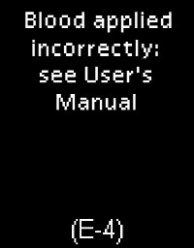 Cassette empty: insert new cassette - This message appears if a test is started and all test areas in the test cassette have been used. Insert a new test cassette in the meter. Cassette defective: insert new cassette - Remove the test cassette from the meter and re-insert it, or insert a new test cassette in the meter. Cassette invalid: insert valid cassette - Insert a test cassette suitable for this meter type. What does the error code (E-2) mean? Cassette? Insert new cassette - There is no cassette in the meter. Insert a new test cassette in the meter. What does the error code (E-3) mean? 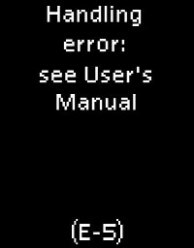 Meter error - Retest - A meter error has occurred or the meter is defective. 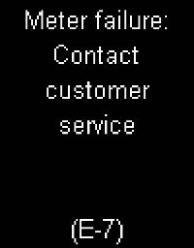 If the error message is still displayed after turning the meter on again, contact the Customer Careline. The meter may be defective. What does the error code (E-4) mean? Blood applied incorrectly: see user’s manual - Too little blood has been applied to the test area OR the user did not apply the blood to the centre of the test area or applied it too much to one side. Repeat the test with a larger amount of blood. Apply the blood drop to the centre of the test area. Cassette dirty: Clean per user’s manual - Remove the dirt inside the tip of the cassette and, if necessary, carefully clean the measuring optics. What does the error code (E-5) mean? Applied a contaminated blood drop (for example, due to food or drink residue on their finger). Did not remove their finger from the test area as soon as they heard the beep tone. The user should wash their hands with warm water and soap and rinse well. Hands should be thoroughly dried with a clean towel before obtaining blood. Touch the test area gently and steadily with the blood drop or control solution. Apply the blood drop or control solution to the centre of the test area. Avoid trembling or shaky movements. 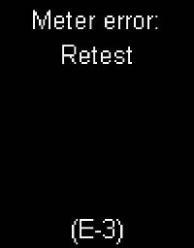 Remove the user's finger from the test area as soon as the beep tone sounds and 'Test in progress' is displayed. The beep tone helps the user to obtain a reliable test result. What does the error code (E-6) mean? 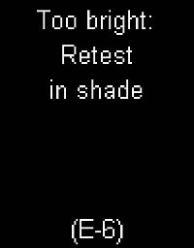 Too bright: retest in shade - Move into the shade or shield the meter from sunlight. Repeat the test. 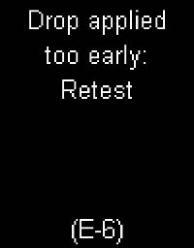 Drop applied too early: retest - Do not apply blood or control solution to the test area until the apply drop prompt is displayed. Repeat the test. What does the error code (E-7) mean? Meter failure: contact customer service - If the error message is displayed after turning the meter on again, contact the Accu-Chek Customer Careline. What does the error code (E-8) mean? Temperature too low: retest in a warmer location - Move to a place where the ambient temperature is at least +10 °C and wait for the temperature of the meter to adjust to this temperature. 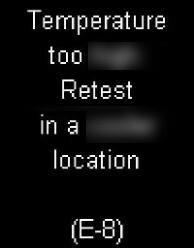 Temperature too high: retest in a cooler location - Move to a place where the ambient temperature is not higher than +40 °C and wait for the temperature of the meter to adjust to this temperature. What does the error code (E-9) mean? 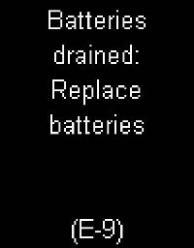 Batteries drained: replace batteries - Insert new batteries. Accu-Chek Mobile Users Survey 2013. Respondents using the Accu-Chek Mobile as their main meter n=3,132. Data on file.